Even as outbreaks of measles and whooping cough — diseases once considered eradicated in the United States — surge around the country, more people are still choosing not to vaccinate their children. The rise of the anti-vaccine movement is not only dividing parents on the playground, but causing strife within families. Whether it’s a disagreement between siblings, or a generational spat between grandparents and adult children, the fear of vaccines and fear of disease-sickened kids is increasingly being played out at home. Sundari Kraft of Denver, Colorado, the mom of a 2-year-old, advises parents in her community about the benefits of immunization as a volunteer for a pro-vaccine group. But there's one person she doesn't bring the subject up with: her sister, whose four children are unvaccinated. “His parents think we are in the wrong and still ask my husband to let them hold (the baby) anytime we are together — it is a firm no!" While anti-vaccination proponents, many of whom believe that vaccines and the preservatives in them cause disorders such as autism — a theory that has been debunked — are a relatively small part of the population, they’ve become so vocal vaccine resistance is growing in certain areas of the country, such as San Diego, Texas and Portland, Oregon. 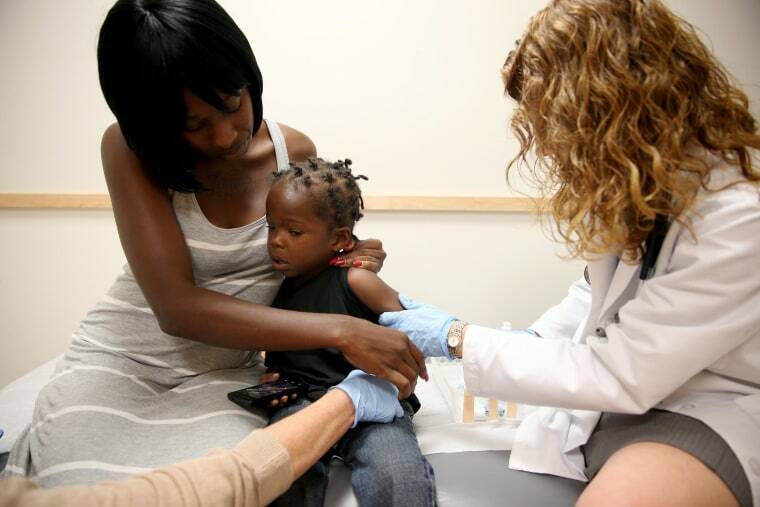 Twenty states allow nonmedical exemptions to vaccination. Staci Lee Kortz-Krueger says the vaccine issue has been an ongoing fight in her family ever since she and her husband had a premature baby. When the baby was in the NICU at the hospital, they wouldn’t let her husband’s brother and sister-in-law visit because they don’t vaccinate their kids. Kortz-Kreuger says they also don’t let them hold the baby, which in turn has upset her husband’s parents. Over the last eight years, pediatrician Dr. Nathan Boonstra says more parents in his practice at Blank Children’s Health Center in Des Moines, Iowa have been questioning vaccines, although families tend to argue over specific shots rather than all immunizations, he says. National vaccination rates for children 19-35 months are now above 90 percent for several key shots, including MMR (mumps, measles and rubella), DTAP (diptheria, tetanus and pertussis, and polio, so obviously most Americans favor immunizations. But those rates are slightly below the 2003 high of 93 percent for MMR and 96 percent for DTAP, according to CDC figures. While Boonstra advocates for full protection against preventable diseases, it's particularly crucial for high-risk children, such as an immunocompromised child, he says. When families are in disagreement over vaccines, he says, "my best advice is for both parents to continue to talk to the child's doctor, and be willing to listen to the doctor and each other." Doctors could help resolve disputes by thoroughly addressing a parent’s concern about vaccines. “A primary care doctor often doesn’t have a lot of spare time during a day, but I think it’s crucial to make the time,” says Boonstra. “The more I started to read about it, the more I became vehement about not doing it. The risks outweighed the perceived benefits." Health officials worry that as more families resist vaccines, there will be more outbreaks of measles, whooping cough or other childhood infectious diseases. A recent report from the CDC estimates that vaccines given over the last 20 years will prevent the deaths of hundreds of thousands of children and more than 21 million hospitalizations. However, research has shown that scare tactics about disease-sickened kids can backfire with parents. Sue Leusner, a mom of two in Tacoma, Washington, stopped vaccinating her children when her second child, a son, started showing signs of autism — walking on his tip toes, loss of eye contact and loss over verbal skills — at 18 months old. “The more I started to read about it, the more I became vehement about not doing it. The risks outweighed the perceived benefits,” she says. Leusner persuaded her husband not to take her oldest child, then 4, to the doctor for booster shots. While members of her family respected her decision, some still don't agree. Leusner just doesn't talk about it with them, adding, "There are some people who have made up their minds, and you are not going to change their minds." What's more difficult for Leusner is the opinion of people she doesn't know. “It’s very polarizing and you get totally demonized as a parent if you don’t vaccinate,” says Leusner. Melissa Marr, who along with her husband is a chiropractor, researched vaccinations long before her daughter was born. She says that after weighing the pros and cons, they decided not to vaccinate their daughter and are now not vaccinating their 6-month-old son. She calls the family dynamic that developed as a result of their decisions a "generation gap."